Cortrex by Thorne Research is great product. Cortrex by Thone Research allows me reverse my insomnia! I have been taking Cortex by Thorne Research for over a year. 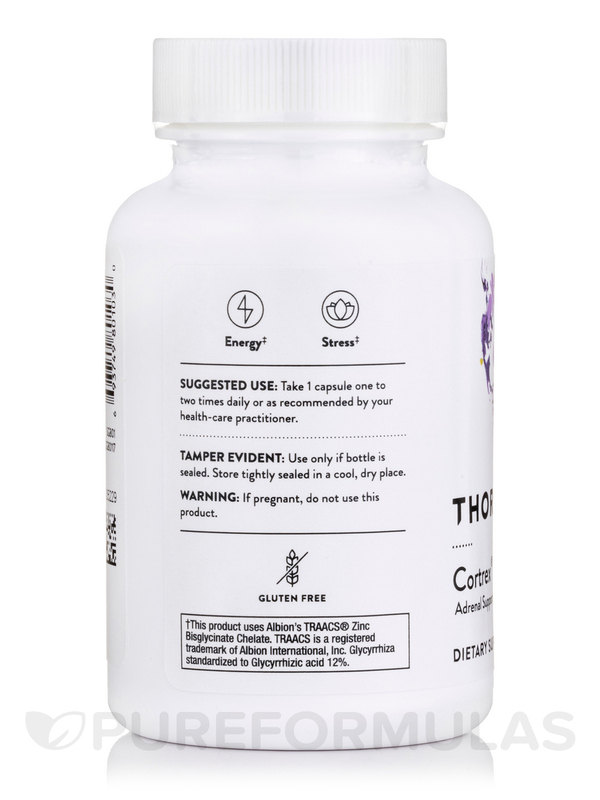 Cortrex® Adrenal Support Capsules by Thorne offer multi-faceted nutritional support to promote healthy adrenal function‚ which can support the body’s natural response to stress. Cortrex was designed to supply the body with nutrient‚ botanical and glandular nutrition to help the adrenal system do its job. 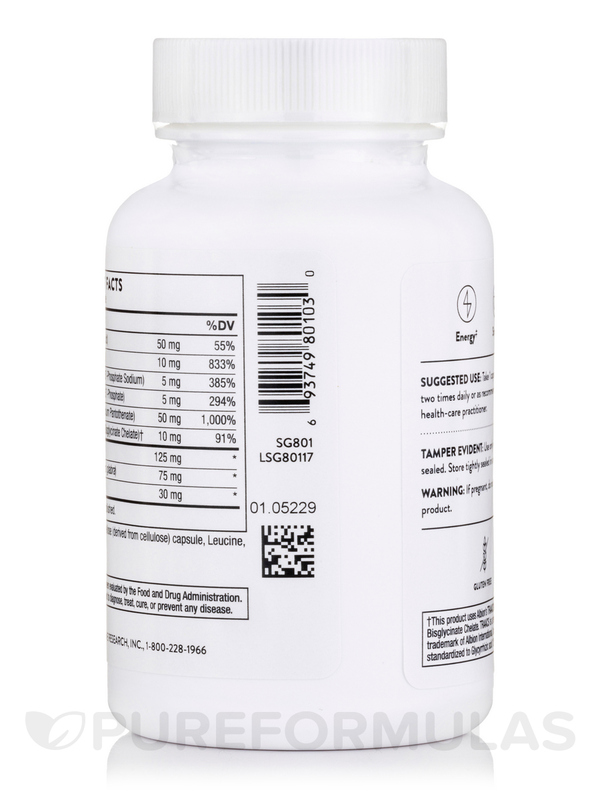 This supplement is designed to help support and maintain both mental and physical stamina. And‚ as you’ve come to expect from the experts at Thorne‚ Cortrex is made to conform to the utmost quality standards. This supplement is free of preservatives‚ lubricants‚ and diluents. Cortisol is a hormone that is naturally produced by the body‚ in the adrenal glands‚ to deal with periods of stress. It is essential for regulating blood sugar and maintaining fertility‚ immune function‚ and overall mental and physical stamina. Under normal circumstances‚ the body’s adrenal glands are built to cope with the demands that life puts on us. However‚ when you’re faced with periods of chronic stress‚ your adrenal glands can become tired from all the extra work. This can eventually lead to problems that can be seen throughout the entire body. When the body is short on cortisol‚ you may feel tired or run down on a regular basis. You may also feel muscle weakness and joint pain‚ or you may experience unexplained weight loss. How Do Adrenal Glandular Tissue Extracts Help? Adrenal glandular tissue extracts help by supporting healthy cortisol levels and immune system function. This is because these tissue extracts play an essential role in supporting the adrenal glands. Cortrex delivers a formulation of adrenal glandulars along with nutrients to best support your overall adrenal function and allow you to maintain optimal cortisol levels. 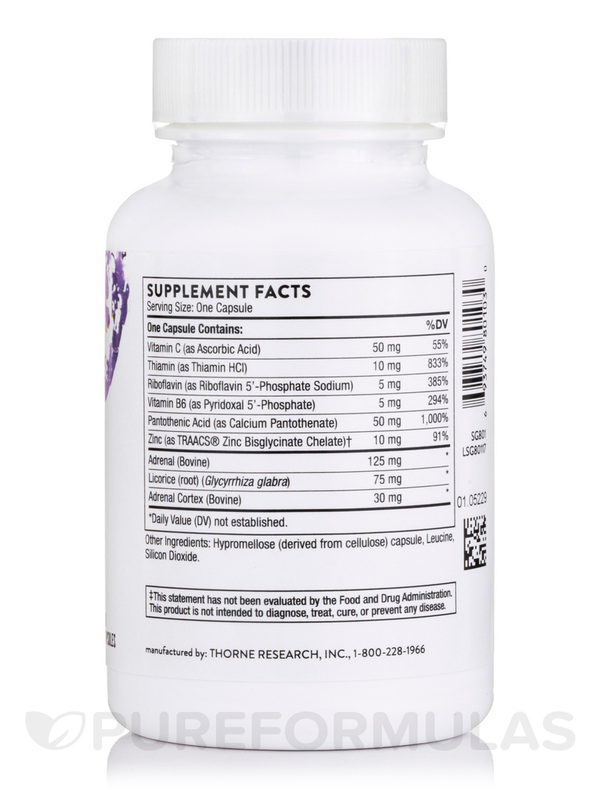 In this supplement‚ whole adrenal tissue and adrenal cortex make up part of the formulation that specifically is designed to tonify the adrenal glands. Licorice root (also known as Glycyrrhiza glabra) was included for its modulating effect on cortisol activity. Among all herbal remedies‚ licorice root is believed to be most effective at modulating cortisol. It has been used for centuries in traditional Chinese medicine because practitioners believe it can enhance the potency of any cortisol that is being produced by the body by inhibiting the breakdown of cortisol in the liver. Whenever treating a condition in the body whereby a system seems to be malfunctioning‚ it is important to ensure the body has adequate nutrition to support such functions. 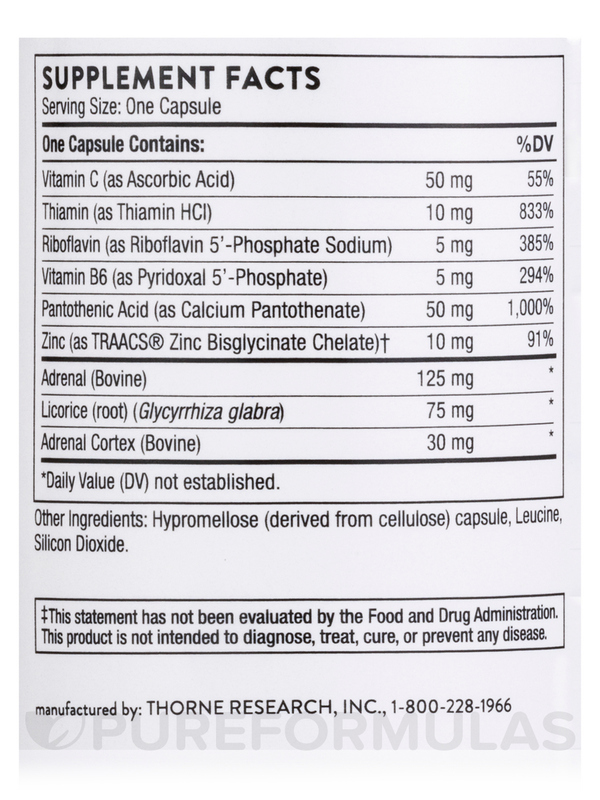 This is why Thorne includes vitamins in its Cortrex supplement. The specific vitamins that were included were chosen because of their supportive and strengthening roles in optimizing adrenal function. Those vitamins include zinc‚ ascorbic acid (pure vitamin C)‚ thiamine (vitamin B1)‚ riboflavin‚ pantothenic acid (vitamin B5)‚ and pyridoxal 5-phosphate (vitamin B6 in its active form). 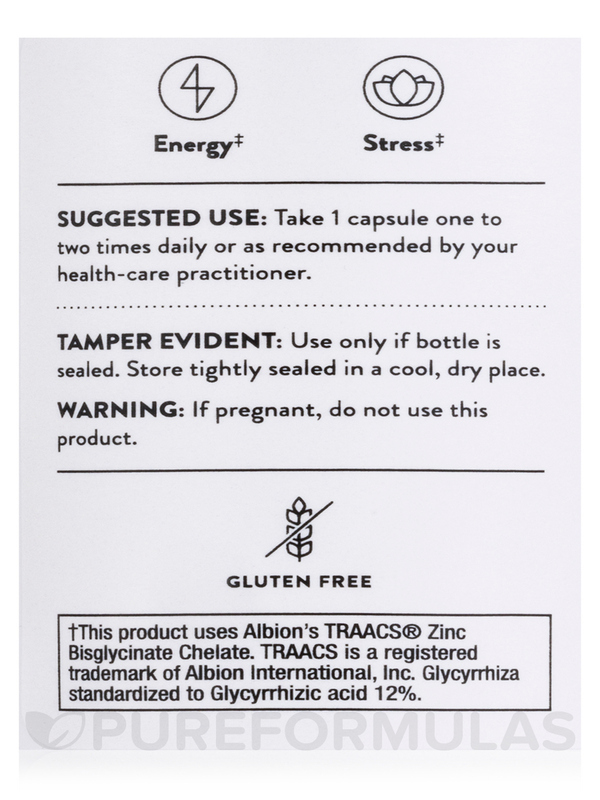 †This product uses Albion's TRAACS® Zinc Bisglycinate Chelate. TRAACS is a registered trademark of Albion International‚ Inc. I was recommended to take this for my adrenal fatigue and it works. I have been dealing with adrenal burnout. I can barely get out of bed or function throughout my day. I noticed a huge difference using this product. I've tried many other adrenal supplements and nothing quite works as well as this... I take it first thing in the morning and my doctor directed me to take two more when I feel a lull or tired. I take 6-7 per day but hoping to decrease dose once my adrenals get stronger. I am able to function better and get up easier each morning. Thankful for this supplement! Also, don't take after 5p or too late in the day. Doctor recommended Cortex by Thorne Research and it definitely helps me with getting less stressed as much! I've noticed an improvement in my energy since taking Cortex by Thorne Research. I have used Cortrex by Thorne for years whenever I feel run down and tired. It helps me to feel more even keeled and helps with my allergies and fatigue symptoms. Very easy on the stomach and provides excellent adrenal support. One capsule twice a day helps with multiple symptoms for overall health. I have been taking Cortex from Thorne Research to bounce back from adrenal fatigue and it really has made a significant difference in my mood and energy levels. I like that it is easy to swallow and does not cause me to end up with too much energy. I felt a surge of energy instantly. 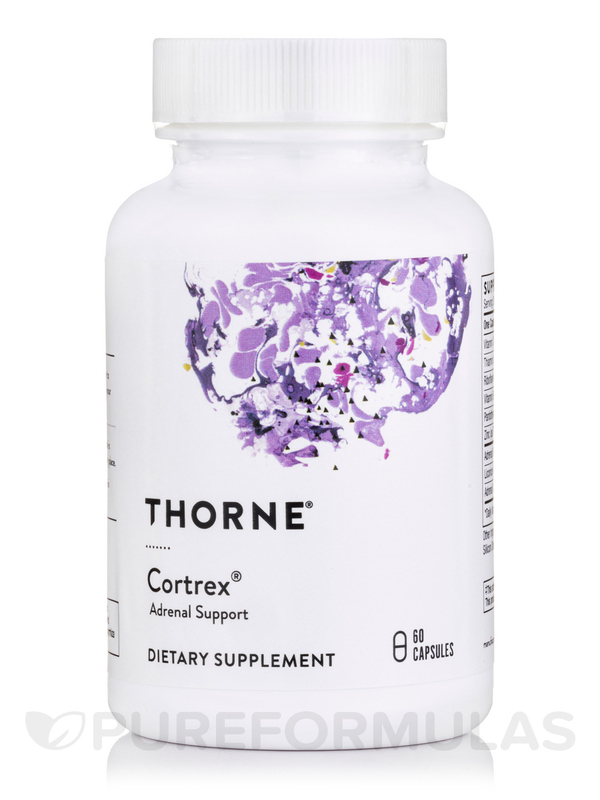 My body responds well to Thorne products, but Cortrex by Throne Research is the best by far! No exhausted feeling at 3 o'clock like I usually experience. Wish there was a bigger bottle I could buy! I was diagnosed with severe Adrenal Fatigue by my doctor, and Cortrex by Thorne Research truly saved my life. The Licorice root and Adrenal Bovine help my adrenals support themselves. It gives me energy without the shakes and anxiety normally associated with 'energy' products, and it provides my body with the B-vitamins that are so hard to find in a vegetarian diet. It is also hypoallergenic, which is great because I have so many sensitivities. I have been using Cortrex for 1 year, and will continue using it because it has helped improve my condition, and this site offers such an amazing deal! Non irritating, great for ingredient sensitive people; Capsules are easy to break open; provides steady, long-lasting energy that doesn't tax the adrenal glands; low price, free shipping. Why don't you supply THORNE Cortrex anymore? Hello Emily,Thank you for choosing Pureformulas.com, we do apologize but Thorne Research have decided to discontinue to sell us there products. You can now only purchase Standard Process products from your health care practitioner. Have a happy and healthy day.